Happy birthday to me! Cake was white chocolate mud cake – 6 x 8″ cakes filled with white chocolate ganache, the rest was carved styrofoam. Cake is supported by a 16mm dowel right up through the centre of the cake, which was screwed into the board for stability. The labels were edible images designed in powerpoint and printed out, and I backed these with 2mm thick white fondant before adhering to the black fondant the entire cake was covered in, to avoid the problem I have had in the past where an edible image placed on black fondant ends up splotchy from the black colour seeping through into image. The “medals” all represented significant milestones in my life, ranging from dux/valedictorian of my high school, through my two degrees, through the births of my children. The “vintage” of the bottle was 1972 since it is my 40th, and the back label declares “drinking well and aging well”, “contains 0.08 alcohol” and a few other similar messages. The black fondant was wrapped around the bottle horizontally in one piece. The gold “foil” of the bottle was done with 4 separate sections of ivory fondant which was then painted gold. I hand painted rather than airbrushing as I didn’t think the gold airbrush colour I had was lustrous enough, and I didn’t want to put the lustre dust/alcohol mix into my airbrush as the dust can damage the needle in the airbrush. I added “seams” like you see on a real bottle over the join by using the thin flat attachment on my sugarcraft gun. For the first time ever I took various photos of the “in progress” bottle so you can see how I carved and constructed the cake, which are shown below. Dark chocolate mud with dark chocolate ganache. Board is covered in black vinyl. 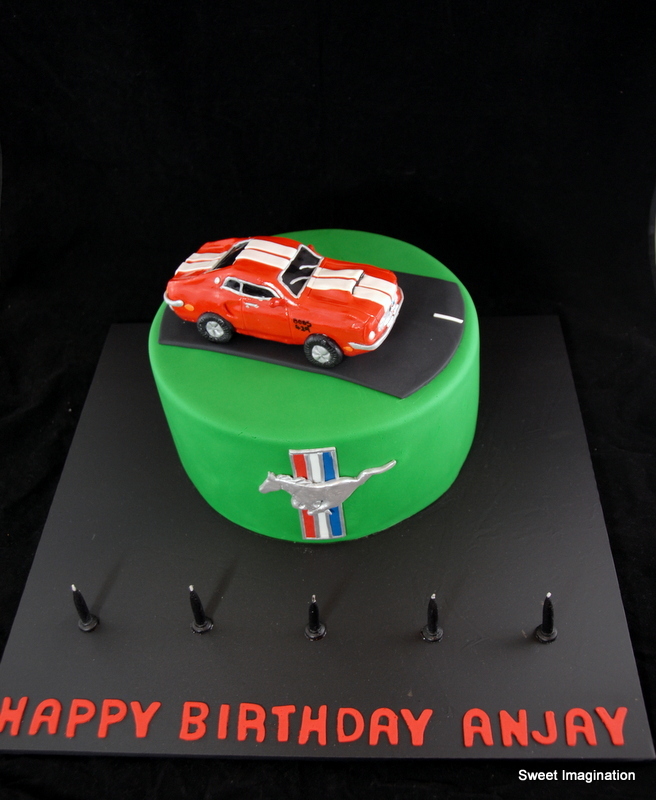 Mustang car is fully edible and made of LCMs (rice cereal treats) and white modelling chocolate covered in fondant. Shiny look comes from painting whole car with crystalline. The mustang logo was done by getting an outline from google, cutting out thick grey fondant of the outline, then using the balling tool to indent to the shape of the mustang horse on the mustang logo. Once the definition was in place I painted with silver lustre dust. I started with silver airbrush sheen but thought the lustre dust gave a better finish. Cake is dark chocolate mud cake, filled and finished with dark chocolate ganache. Cake was first covered in white fondant, then red and white stripes added and “exploded”. Stars on board are made of grey fondant and hand painted in a mix of silver airbrush paint and silver hologram dust for added sparkle. 70th birthday cake for Carole – lovely lady who looked 55 at the most! Cake is orange-almond gluten free. All items are edible except the “bling” – the “70″ and the sparkles over the strap. There is also a wooden skewer in the heel of the shoe supporting it and holding it onto the cake. The shoe took approximately 1 week to dry. It is based on my own massive size-12 shoes, so is quite large, the cake measured 20cmx30cmx10cm (roughly A4 size). I carved a mold to dry the shoe over from styrofoam to give the nice curve in the sole – as I’ve seen a lot of these shoes that have quite sharp angles from the things they are laid over that you wouldn’t see in a real shoe. The other option suggested by many websites is that you use a real shoe – something cheap that you can rip apart – but I didn’t really want to be drying something people would eat over a real shoe (even if it was brand new and never worn ). The shoe is made out of fondant stengthened with tylose, and painted with Crystalline. My first time using Crystalline, it has a similar consistency to piping gel but is slightly thinner and paints on better (doesn’t leave such defined “brush” marks as piping gel does). For overall flawless gloss effect I still prefer Canola oil but this is a temporary effect that needs to be re-painted just prior to serving so not practical unless the decorator is going to be attending the event or delivering very shortly before cutting. The C “Label” on the shoe was meant to represent “brand Carole” and was a last minute addition after the shoe snapped in the middle. This label covered up the break nicely and held the shoe together. I learned a couple of lessons with this one: make the sole thicker so it is stronger, and also make a spare shoe. I think it never hurts to have a spare one on hand for those last minute orders we all get but often can’t take because there is not enough prep time or you are busy with other orders – if you have a spare on hand it takes a large amount of the work out. The board is covered in white vinyl and there is a black ribbon around the edge. Buzz Lightyear figurine cake for William’s 4th birthday. All items on the board (except the candles and one cake dowel to hold up Buzz) are edible, including the stars. The “alien” has some small pieces of dried spaghetti inside him to provide support so that he will be fully edible. My philosophy on this cake was to make everything edible, since it was for a 4th birthday party, and kids love eating the figurines and “extra” items on the board. This did, however, prove rather difficult, and I was not entirely happy with the shape of Buzz’s body. I have decided that in future I will ask the clients if they would prefer fully edible (and perhaps not perfectly shaped) figurines, or if they would prefer perfectly shaped but inedible items that include styrofoam and wiring to get the shape right. In my (parental) experience if you go for the latter on a small child’s cake you need to carefully supervise the cake from small grabbing hands that like to put everything in their mouths. I also sometimes question the value of modelling perfect but inedible versions of toys – would it be better to just put a plastic version of the toy that the child can then keep on the cake? As a cake artist I hate the idea of this as there is no art in it (and I have never used plastic toys on my cakes) but is it valuable to have an inedible icing figurine that the child can’t eat, and if they decide to keep it, may melt in humidity or high temperatures? The “moon” is a chocolate mud cake, made with a soccer ball tin cake on top of a carved 10″ round. The moon indentations are made with measuring spoons pressed into the fondant, and the whole thing is airbrushed with silver edible paint to create a silvery moon effect and highlight the indentations more. Cake for Shiseido 140th Anniversary celebration held at MCA in Sydney. Cake is white chocolate mud with dark chocolate ganache at client request – first time I have ever provided a cake tasting and it went down very well. Client requested specific PMS colour match – managed to get the colour pretty exact by requesting a sample of advertising material (they sent a marketing bag) and matching to that. Cake itself was a 50cm diameter monster of a cake. Not having an oven this large, I made this by cooking 8 individual 10 inch cakes, then stacking and carving those. If I have another of these to do I will make the cakes larger – probably 12 inch – to give myself more carving room. Lettering was done by printing out logo to the required size on edible paper, which was then placed on gumpaste and cut out – got the shape well but wasn’t the best finish in terms of crisp colour so I ended up peeling the edible paper off painstakingly. Next time I would use a very old method learnt at community college (!) where you cut templates out of plastic and cut around those. Board was a custom cut as it was 24″ (or 600mm) square – as cake boards don’t come in this size this was MDF from Bunnings. I then covered this in black vinyl myself and added feet. The vinyl was a bit difficult to work with on account of it being folded too much, pulling tightly did not sufficiently remove creases so I ironed on a medium heat with a tea-towel over the top and it came out nice and smooth. Radha’s 1st birthday cake – purple background with mirror ball finish to match invitations. Cake is white chocolate mud with white chocolate ganache. Mirror ball finish created by cutting out over 500 individual little squares and sticking on surface like a jigsaw, then hand painting with a mixture of silver airbrush colour and silver jewel hologram dust. Marilyn Monroe cake for Michael’s 70th birthday. Cake is dark chocolate mud with dark chocolate ganache. Marilyn is a printed image, in a “frame” – grey fondant with imprint from curly imprint mat, hand-painted in silver. Two tier cake for Veronika’s 40th. Design started with a request for orange coloured icing, on either a dark chocolate mud cake or and orange almond cake, so I did both. Bottom tier was dark chocolate mud and top tier was orange-almond gluten free. Top tier is patterned with a swirl fondant mat I was given recently (thanks Cel!) and was keen to try out. It was also airbrushed with pearl sheen for a bit of a “lift”. ”V”s around bottom tier with a combination of continuing the swirly pattern from the top tier and a play on “V”. These are piped and hand painted with gold lustre dust and rose alcohol. Board is deliberately left uncovered because I liked the gold colour with the rest of the cake. Top tier has diamante “bling” around the bottom just because. Birthday message was piped and handpainted with pearl sheen to match the top tier. The humidity was a major problem on this cake, and the image “melted” a bit and then stuck to the lid (which I discovered the morning of delivery – eeek! lots of running around to get a replacement!). I learned a couple of things here: don’t put an image onto black fondant, the colour will seep through into the image and darken it; don’t underestimate the damage humidity can do; don’t put a lid on a cake box unless you are sure it doesn’t touch the cake; and if you are ordering an A3 image and can’t get hold of a replacement easily, order 2 images so you have a backup and build this into the price of the cake.